Someone must have made a big offering to the cdrama gods, because Song in the Clouds (大汉情缘之云中歌), also known as Yun Zhong Ge, has now announced a broadcast date as well: June 30th. Starring Angelababy, Du Chun, and Lu Yi, Song in the Clouds is an adaptation of a novel by Tong Hua (of Bu Bu Jing Xin fame). The story takes place after Desert Melody, now titled Legend of the Moon and Stars (星月传奇), which is unfortunately still in that post-production void. In a nutshell, Song in the Clouds is the story of Huo Yunge (Angelababy), who rescued Liu Fuling (Lu Yi), the Emperor Zhao of Han, when he was eight years old and lost in the desert. Fast forward ten years, and Yunge is off to the emperor’s court looking for the young man she rescued. 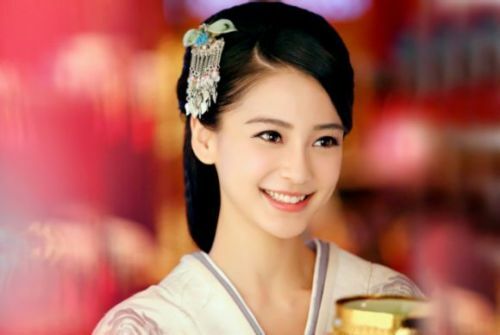 Unfortunately, she meets and falls in love with Meng Jue (Du Chun), only to discover that she’s being exploited by those hungering for power in the imperial palace. Song in the Clouds is produced (though not written) by Yu Zheng, and also features everyone’s favorite Chen Xiao. It will air on Zhejiang TV, Jiangsu TV, Shenzhen TV, and Dragon TV. This entry was posted in Mainland China, Television and tagged Angelababy, Chen Xiao, Du Chun, Lu Yi, Song in the Clouds, Tong Hua, Yu Zheng, Yun Zhong Ge by Jo. Bookmark the permalink. Is this air date still true? My fingers are crossed too. If these two along with that drama Fan Bing Bing is working on airs during 2014-2015 year than this year will be awesome for us. SO MANY THINGS TO WATCH … but not enough time. Ugh, should have made that offering more specific- I wanted it to /not/ be released, cdrama gods! …and so my bias against this drama continues. Oh yay!! It really is our lucky week!